Gary Moulds (left) and Steven Kirwin in Switzerland. Lisburn’s Gary Moulds had a dream start to his Grand Prix debut in Switzerland - scoring points at the first attempt against the best riders in the sport. The Lisburn rider, with experienced English passenger Steve Kirwin in the chair, arrived at the Roggenburg circuit brimming with confidence. In their qualifying race on Saturday the pair had the misfortune of a wheel coming off the chair, meaning they had to qualify in the last-chance race to make the two Grand Prix races on the Sunday. “We were in the ‘A’ qualifying race and the wheel came off the chair on the last lap when we were in 11th place and automatic qualification for the main event,” said Moulds. “It was something I never experienced before and later found out that I should have had a left-hand threaded wheel spindle as all the camber on the corners meant the wheel worked loose during the race. “It was changed before the last-chance race. “I had a look at the lap times from qualifying before the last-chance race and was certainly confident of achieving at least the necessary top-six finish but to finish top of the timesheets was more than we could have expected. “There were a couple of crashes in front of us at the start of race one but we made some good passes and worked our way into 15th before the kill switch came out and the bike stalled. “As it happened at the top of the hill we had to wait until we reached the bottom before getting it fixed and restarted. “We lost five positions before getting back into the race. “It was something, like the wheel spindle issue in qualifying, that had never happened to us before but we made up the lost time and positions to finish 15th and score six World Championship points by the flag. “I was delighted and in fact if I hadn’t have taken a stitch during the race I reckon we would have finished higher. “In race two we made a good start and were running 12th for a good part of the race before the exhaust pipe broke with four laps to go, while we were pushing for 11th. “It meant we lost power and places, dropping us down to 16th. “With the exhaust noise I wasn’t giving it full throttle and we dropped some places to 16th by the flag, however, when the scrutineers checked the bike after the race and the exhaust noise levels were outside the permitted levels they penalised us five places, meaning we finished 21st and 19th overall. 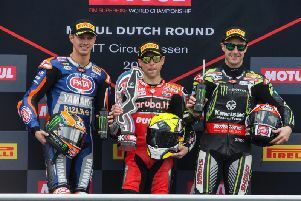 “I was disappointed with the outcome of race two but, overall, it was a dream-come-true to race with the best in the world and score World Championship points. “I came into the meeting with no expectations apart from to enjoy the experience and left feeling on top of the world with points in the bag. “It doesn’t get any better and I am really looking forward to this weekend and the French Grand Prix. At the head of the championship, Marvin Vanluchene became the youngest World champions in the history of the sport when, with co-driver Ben Van Den Bogaart, he took the overall victory thanks to second in race one and a win in race two to claim the title with a round to spare.